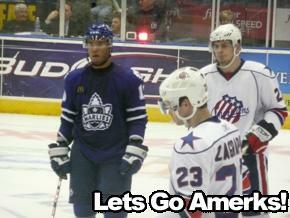 Amerks Lose to First Place Marlies · Let's Go Amerks! Â The Amerks lost to the first place Toronto Marlies on Friday night by the final score of 5-2.Â The turning point in the game came half way through the second period when the Amerks had a goal disallowed due to goalie interfence, moments later the Marlies scored to make it a 4-1 game. Simon Gamache of the Marlies scored the first goal of the game early in the first period on the power play, Dylan Hunter had been sent to the box for holding. It was an even game during the first period as as each team put 9 shots on goal and the Amerks were holding down the fort competing for the tying goal heading into the second period. At 2:57 of the second period Mike Weber sent a great pass to Peter Aston whoÂ shot the puck at the net and Anthony Stewart tipped it in to the net for his eight goal of the season toÂ tie the game at 1-1. Staffan Kronwall scored on a power play for the Marlies at 9:15 of the second period, followed by Kris Newbury only 11 seconds later which made it a 3-1 game. Shortly after the half way point of the second period the Amerks went into the Marlies end,Â the puck was shot into the net but disallowed due to goalie interfence as a Marlies player pushed PatÂ KaletaÂ into theÂ Marlies goaltender.Â This would’ve made it a 3-2 game, but moments later Jiri Tlusty scored to make it a 4-1 game in favor of Toronto and that was pretty much it. Marek Zagrapan did score a power play goal assisted byÂ Meyer and MacArthurÂ to cut the Marlies lead in half. Kris Newbury scored in the third period to finish the scoring in the game where it ended at 5-2. The loss can’t solely be blamed on the bad call by referee Jamie Koharski, although it may have been the turning point we needed.Â The two power play goals scored by the Marlies were because of bad penalties taken by the Amerks that could have been avoided.Â You can’t reach out with one arm to slow down an opposing player, or put up a knee when hitting an opponent.Â Had the Amerks avoided those undisciplined penalties it may have been a different game altogether. Both teams seemed to be falling all over the freshly layed ice at Blue Cross Arena, who would’ve ever thought ice could be umm more slippery than it usually is. David Shantz started in goal for the Amerks and saved 16 of 21 shots faced, but has definately been improving with each game he’s played.Â After the gameÂ he said, “we should’ve won the game.”Â He’s exactly right, but they’ll have two more chances this month to beat the first place Marlies. On an unrelated note that bares no outcome on the game, he said he’s hoping to have his shiny white helmet painted in the next few weeks. The Amerks will complete their weekend at home on Sunday, December 9th as they welcome the second visit from the Binghamton Senators to The Blue Cross Arena. The 6:05 p.m. contest will be broadcast live on Hot Talk 1280 WHTK, whtk.com and B2 networks. The game will be the third of eight meetings this season between the two New York State teams. The contest falls on a Supercuts $6.00 Sunday. All kids 12 and under can receive a ticket to the game for just $6.00. After the game, fans can head down to The Distillery at 3010 Winton Rd South to enjoy the official postgame party. Show your guest check from The Distillery at the BCA Box Office for a $3.00 discount off any 100 or 200 premium Amerks ticket. (Regular price $21).